The Ingleton waterfalls walk in the Yorkshire Dales is one of the most spectacular waterfall and woodland walks in the UK - if Carlsberg did waterfall walks, this would probably be the best waterfall walk in the world! The walk is easy to follow and passes Pecca Falls, Hollybush Spout, Thornton Force, Beezley Falls, Rival Falls, Baxenghyll Gorge and Snow Falls. The trail leads through ancient oak woodland and typical Yorkshire Dales scenery via these stunning waterfalls and other geological features. A good time to go is a day or two after heavy or prolonged rain, with my personal favourite being late April, with the spring flowers in full bud but before the leaves come back on the trees. The walk is open seven days a week, throughout the year (closed Christmas Day) and opens at 9am. Closing times vary throughout the year. Parking: The walk starts from the car park at the start of the Ingleton waterfalls trail (grid reference SD 692 734) - There is a charge to enter the walk, which goes to help with the upkeep of the walk as most is on private land. There is other parking available in Ingleton. 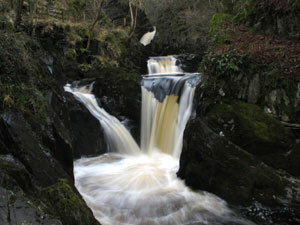 Facilities / refreshments: Pubs and cafes in Ingleton. There is also a refreshment hut and café en-route.